This is a tour that takes you off the beaten path and exposes you to the real culture of the Maya people. Bike to the cenote Xcanche for rappelling and swim in the clear water. Playa del Carmen, Puerto Aventuras, Akumal or Tulum hotels please book the Chichen Itza, Ik Kil and Coba tour instead. 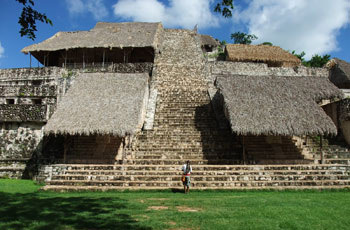 It is less driving and Coba is a comparable site of ruins to Ek Balam. You will have the option to add on transportation in the shopping cart on the next page.